On Monday, May 20, undefeated, pound for pound star Floyd Mayweather took to his personal Instagram page, where he updated his fans with some news about his daughter Iyanna. 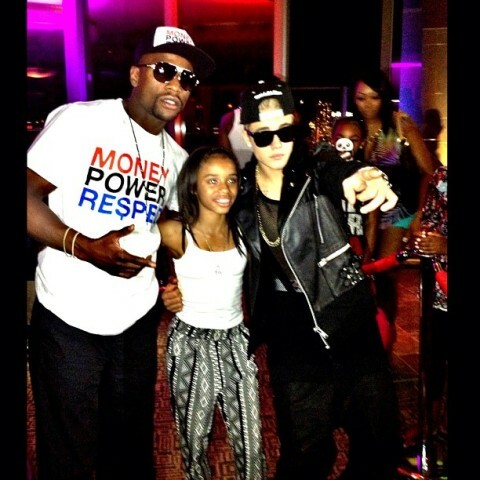 Iyanna turned 13 years old on May 20 yet she was seen celebrating her birthday this past weekend in Las Vegas. One of the surprise guests who swung by to help her celebrate her birthday was none other than pop superstar and Mayweather friend Justin Bieber. In town for a performance at the Billboard Music Awards, Bieber made time to hit up Iyanna’s party, as evidenced by an Instagram photo posted by Floyd. His message would read the following. Mayweather is coming off of a victory over Robert Guerrero on May 4 inside of the MGM Grand and he is slated for a return to the ring on September 14.